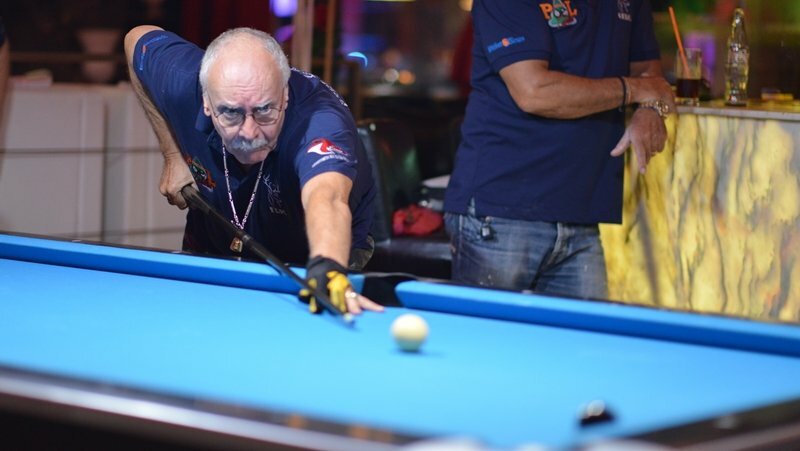 POOL: The Rawai Pool League resumed on Monday (Sept 24) after a weeks break following the sudden and tragic death of Black Bull owner Kevin Bayard. Last week hundreds of players and friends came together at Black Bull to commemorate Kevin’s life and pay their respects to his family. Despite the heartbreaking loss, it was heart-warming to see everyone together, showing what a wonderful community they have in Rawai. Kevin was much loved and will be missed by all who had the good fortune to know him. This week’s big game in Division A was a top of the table clash between Shot Bar and Black Sheep. Most would have considered this to be a tight game between two of the favourites for the title. However, that was not to be the case as Black Sheep romped to 1-6 victory against their rivals. Only Shot’s Pan managed to get a point on the board for the home side. Mango Bar capitalised on Shot Bar’s defeat to move into second in the table with a comprehensive win away to Spot Bar. Mango Bar had the game won at the end of the singles, then they won their first doubles leg to give them a 0-5 lead. Eddy and Dao managed to get a point on the board for Spot Bar and teamwork proved crucial when they deservedly won the beerleg to earn a respectable 2-5 scoreline against a very strong Mango side. White Hart are still in the race to retain their title with a hard fought win at home to Black Pearl. After Jig’s early defeat to Tommy, Rob and both Bens put the White Hart in a strong position after the singles legs. But Black Pearl’s Dave, smiling as always, and Tar managed to bring it back to 3-2, but Rob and Ben W’s clever play in the last doubles leg against Tommy and Bang put White Hart’s victory in no doubt. Black Pearl performed admirably in the beerleg to give a 4-3 scoreline which fairly reflected the game. At Future Bar, it looked like an upset might be on the cards as they played bottom of the table Orange Bar. Future’s Chaiya only narrowly managed to win against Bibi, luckily managing to avoid defeat by an inch when he nearly potted the black out of turn. Julien and Tong both played well to put the visitors in a 1-2 lead. Barry started the turnaround for the home side, who went on to win all the remaining legs, to get a 5-2 victory to keep their undefeated home record intact. Pita Bar stay in seventh after their home defeat to Freedom Bar. It was a very close game and full of mistakes to add to the excitement. Freedom Bar’s Popeye had to play at his best to beat Grant, leaving it 2-2 after the singles. This and two doubles victories for the away side gave them a 3-4 victory despite losing the beerleg. The remaining Division A match of the night was won 6-1 by Masaya Bar who entertained Tropical Sands. Masaya Bar are starting to look strong with the addition of Michi, and with both Marcus and Rainier on form, they will surely start to move up the table soon. The big game in Division B was Roses Bar’s home tie with White Hart BBQ. Sergey and Eric had a close game where the black was missed countless times, but Roses’ Sergey came through at the end. Mike, possibly the best player on the night, managed to put the home side 2-0 in front, but a focused Friedhelm produced a superb performance for the visitors and Gero tied the game at 2-2 when Roses’ Kevin managed to foul three times to provide opportunities for Gero to see out the game. In the doubles games the league leaders dominated but great team play by White Hart BBQ in the beerleg left the scoreline at 4-3 on a good night of pool. An emotional night at Black Bull saw them win 5-2 against second place Stor Bar and move to third in the table. It was great to see Franck Bayard, proud father of Kevin, back in action and be the best player on the night. Moonlight Bar did well to beat fifth placed Kilt’n Haggis. Fine play by Moonlight’s Nonny and Patrick ensured a 3-4 win. Laughter, some very good pool with tight games and great craic ensued as O’s Bar hosted Islander A. Bruce, making his Rawai Pool League debut, and Uncle John were the only winners for the home team. Andy M, still disappointed from his third place in the Islander pub quiz last Friday (Sept 21), managed to pick himself up well with a great performance in his team’s 2-5 victory. Islander B, on the other hand, suffered a 2-5 defeat at the claws of the Stoned Crab. Despite being 2-1 ahead, Islander B lost the four remaining legs with both Sam and John playing well for the visitors. The final, and possibly the most fun fixture of the night was the Baroque Bar against Pink Sheep. All the girls had a good time with Pink Sheep winning 3-4 despite losing the beerleg. For fixtures, rankings and match scores please visit the official Rawai Pool League website at http://www.rawai-pool-league.com (or http://rawai.pl for quick access). Even better, come and watch or join in the fun every Monday.